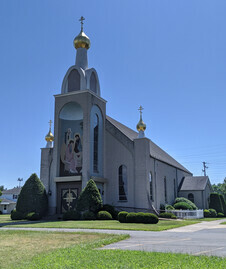 Holy Trinity Church, Wilkes-Barre, is located 1/2 mile off Rt 315. 6:00 PM Vespers (4 PM during Standard Time). 9:00 AM Divine Liturgy (8:30 AM June through mid-September). Twenty seven years ago, a new church was consecrated and dedicated to the glory of God in Wilkes-Barre, PA. After much prayer, sacrifice, and toil, the Holy Trinity Church became a reality. The first Divine Liturgy of the newly-formed parish was celebrated at the Carpatho-Russian School Hall in Hudson, PA, on Mother’s Day, May 14, 1967. Later that month, the first parish council was formed and officers were elected. Michael Stchur was elected as the first senior warden. At the same time, a building committee was chosen and began to function. Joseph P Peleak, a registered architect, was commissioned to design the new church and oversee its construction. On Pentecost Sunday, June 14, 1967, groundbreaking and blessing ceremonies were held on the site of the new church. A banquet was held to commemorate the occasion. The Very Rev George Pawlush assumed duties as the first resident pastor on July 1, 1967, and he immediately organized the church school for the religious education of the young people of the parish. To ensure the success of their goal, many fundraising projects were undertaken by the parishioners. The women of the parish met frequently and held quilt-making bees, where many beautiful handmade quilts were made and offered as prizes at parish bingoes. They also made pizza, donuts, bread, and hoagies. All profits were donated to the building fund. A major portion of the building fund was derived from the making and sale of pierogies. This continues to be a major source of income for the parish. The men and women also sponsored numerous family dinners, bazaars, raffles, and picnics. Excavation of the new church began in early February, 1968. Work was completed in January, 1969. In June, the parishioners witnessed the placing of the three onion-shaped cupolas on the church. The total cost of the new edifice was $370,000, including furnishings. The new rectory was completed in 1971, and in 1976, a pavilion was constructed. In June, 1978, the Holy Trinity parish honored Fr George on the twenty-fifth anniversary of his ordination to the Holy Priesthood. Friends, community leaders, and parishioners paid tribute to Fr George. Early in 1979, in anticipation of the tenth anniversary of the dedication, a decision was reached to have icons written for the sanctuary and on the ceiling of the nave. Mr Constantine Youssis, who had done earlier iconography for the iconostasis, was commisioned to write the icons. In February of 1988, Fr George Pawlush announced his decision to retire. Plans were made to hold a testimonial dinner honoring Fr George and Matushka Anne for their dedicated and unselfish service to the parish. Friends and well-wishers offered congratulations and best wishes. Parishioners expressed their love and gratitude for Fr George’s many years of sacrificial spiritual guidance. Years of harmony and mutual respect were noted at this time. Many Years! On November 1, 1988, Fr John Mason, after appointment by Bishop Herman, arrived from Yonkers, NY and celebrated his first Divine Liturgy at Holy Trinity on November 6. Early in 1994, John Homick was forced, because of failing health, to submit his resignation as sexton and custodian. Mr Homick served the parish throughout its history, laboring, not by the clock, but when duty called. He attended all liturgical services and attended to all emergencies. May he enjoy “Many Years”! On Sunday, November 13, 1994, Holy Trinity Church celebrated its twenty-fifth anniversary. Presiding over the celebration were His Beatitude, Metropolitan Theodosius and His Eminence, Archbishop Herman. Also participating in the celebration were Protopresbyter Robert Kondratick, Chancellor of the Orthodox Church in America, and Very Rev David Lisko, sons of the parish. A Hierarchical Divine Liturgy con-celebrated by Metropolitan Theodosius, Bishop Herman, Frs Kondratick, Lisko, Mason (pastor) and Pawlush (Pastor Emeritus), along with other guest clergy. A banquet has held, at which Fr Kondratick gave the main address.